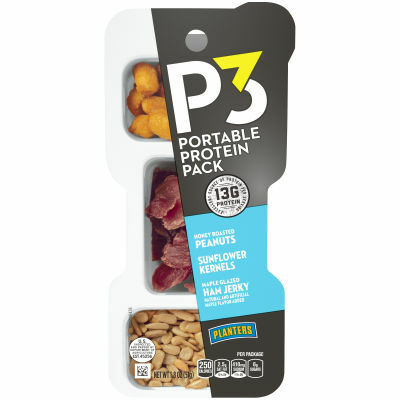 Planters Honey Roasted Peanuts, Maple Glazed Ham Jerky, Sunflower Kernels - Planters brings you three protein-rich foods in a portable pack to help you effortlessly add more protein to your diet. This tray contains servings of honey roasted peanuts, maple glazed ham jerky and sunflower kernels. Satisfy your taste buds and your mid-day cravings with this snack with 13g of protein per serving. - A Delicious Mix of Flavors and Textures - The crunchy peanuts, honey roasted to enhance their flavor with a sweet kick, are packed with flavor and freshness. The maple glazed ham jerky is all you need when craving a tasty treat, and the sunflower kernels have a delicate crispy texture.